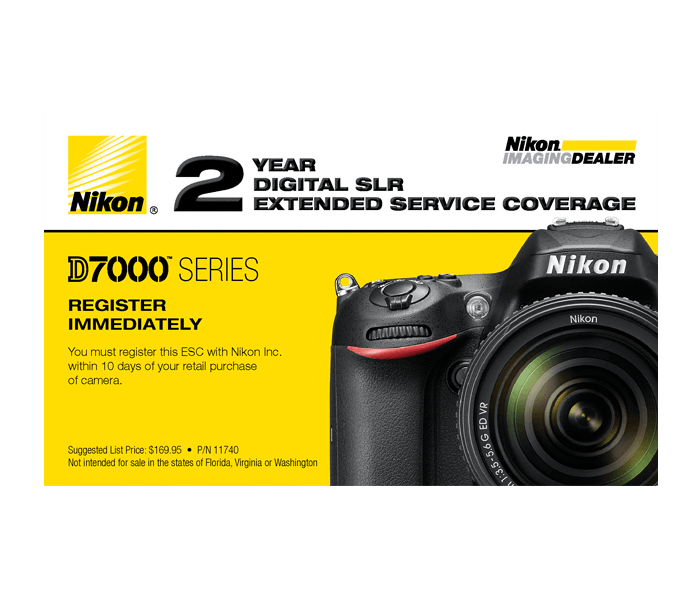 The Nikon 2-Year Extended Service Coverage (ESC) for the D7000/D7100/D7200/D7500 DSLR cameras is offered through Nikon U.S.A. It becomes valid upon the expiration of the Nikon Inc. limited warranty that was included with your camera and provides the coverage specified below for a period of two additional years. ESC applies to the original purchaser only and is not transferable or assignable. ESC does not cover repairs resulting from or due to misuse, abuse, neglect or accident. ESC does not cover repairs resulting directly or indirectly from the use of unauthorized replacement parts, accessories and/or service performed by unauthorized personnel. Coverage dates will be determined by the date indicated on your bill-of-sale. ESC is valid only in the USA, Puerto Rico and the US Virgin Islands. ESC is not intended for sale in the states of Florida, Virginia or Washington. ESC repairs can be performed only by the Nikon Service Stations listed on the ESC document. This warranty can not be sold in the states of Florida, Virginia or Washington.